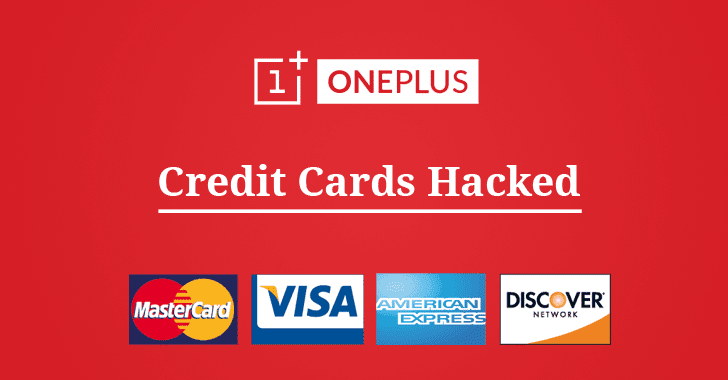 OnePlus has finally confirmed that its online payment system was breached, following several complaints of fraudulent credit card transactions from its customers who made purchases on the company's official website. In a statement released today, Chinese smartphone manufacturer admitted that credit card information belonging to up to 40,000 customers was stolen by an unknown hacker between mid-November 2017 and January 11, 2018. According to the company, the attacker targeted one of its systems and injected a malicious script into the payment page code in an effort to sniff out credit card information while it was being entered by the users on the site for making payments. The malicious script was able to capture full credit card information, including their card numbers, expiry dates, and security codes, directly from a customer’s browser window. "The malicious script operated intermittently, capturing and sending data directly from the user's browser. It has since been eliminated," OnePlus said on its official forum. "We have quarantined the infected server and reinforced all relevant system structures." However, the company believes users who shopped on its website using their saved credit card, PayPal account or the "Credit Card via PayPal" method are not affected by the breach. OnePlus is still investigating the incident and committed to conducting an in-depth security audit to identify how hackers successfully managed to inject the malicious script into its servers. Meanwhile, credit card payments will remain disabled on the OnePlus.net store until the investigation is complete as a precaution, though users can make purchases through PayPal. "We are eternally grateful to have such a vigilant and informed the community, and it pains us to let you down. We are in contact with potentially affected customers. We are working with our providers and local authorities to address the incident better," OnePlus says. OnePlus is notifying all possibly affected OnePlus customers via an email and advises them to keep a close eye on their bank account statements for any fraudulent charges or look into cancelling their payment card. The company is also looking into offering a one-year subscription of credit monitoring service for free to all affected customers.